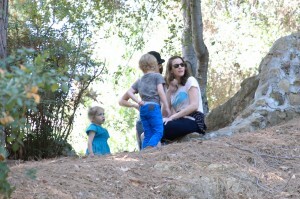 Liv Tyler and her son Milo were spotted spending a nice Sunday playing and hiking around in Griffith Park in LA. The pair met with friends and toured around the park before enjoying some lunch. For comfort Liv wears a pair of Toms Shoes, while Milo sports some UGGs and a distressed skull T.